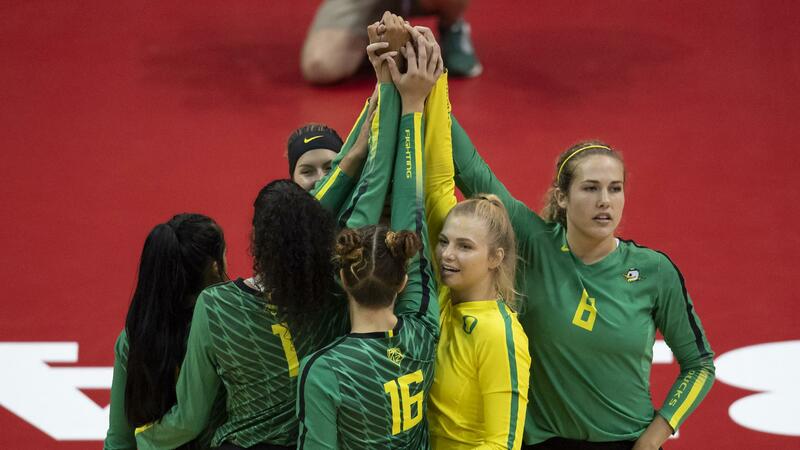 HONOLULU–The Oregon Ducks pulled off the win in five sets over the Hawaii Rainbow Wahine in a non-conference match-up on Friday night in the Stan Sheriff Center. Oregon has now defeated Hawaii three times in a row, but Hawaii is the all-time series leader at 7-4. An early run gave the Ducks the advantage to take set one 25-23. Set two was a blowout, with a 12-1 run in the middle and a 6-0 run to close at 25-10 for Oregon. More consistent play from Hawaii gave them the advantage in set three at 25-22. With another opportunity to end the match, Oregon lost the fourth set by two. The fifth set was a close match, ending at 15-12. The Ducks hit .231 in the match while holding the Wahine to a .176 clip. Oregon led in aces (5-1) and blocks (18-7). Lindsey Vander Weide led the Ducks to the win with 14 kills on 45 swings with six errors for a .178 hitting clip and 12 digs for a double-double, while Taylor Borup added in another 11 kills on 26 swings with one error to end the night with a .385 hitting performance. Ronika Stone made her presence known with 11 kills and Sumeet Gill took the court with a .400 clip. August Raskie produced 50 assists and 16 digs for a double-double while Brooke Nuneviller also picked up 16 digs in the back-court. For the Rainbow Wahine, McKenna Granato put away 16 kills on a .125 clip and added 12 digs for a double-double. Norene Iosia added 13 more to go with 20 assists for another double-double, while Faith Ma’afala dished out 34 assists and collected 16 digs for yet another double-double. The Ducks will host Oregon State in their first Pac-12 match of the season on Thursday. HONOLULU – The 12th-ranked Oregon volleyball team beat Hawai’i for the second time in as many nights to close nonconference play on Friday, surviving a furious comeback attempt by the Rainbow Wahine to win in five sets, 25-23, 25-10, 22-25, 23-25, 15-12, before 6,141 fans in the Stan Sheriff Center. August Raskie, Ronika Stoneand Lindsey Vander Weide all notched double-doubles to lead the Ducks, who wrap nonconference action at 7-3. Oregon will begin its rigorous Pac-12 Conference schedule next Thursday, September 20, with a Civil War showdown with Oregon State in Matthew Knight Arena. How it Happened: Raskie picked up a couple kills on second-touch dump shots early on as the Ducks scored six straight to jump out to a 7-3 lead. Hawai’i (4-5) played to within one, 11-10, and then traded points with the Ducks to a 23-23 tie. Raskie gave UO set-point with her third kill before finding Sumeet Gillfor a kill to finish off the set. Raskie filled up the stat sheet in the opening frame with 10 assists, five digs, three digs and two blocks. Hawai’i held a brief 4-2 lead in the second, but five straight kills by Stone, Vander Weide, Taylor Borup (two) and Raskie ignited a 12-1 run as the Ducks broke it open, 14-5. Leading 19-10, Oregon put together a 6-0 run that included kills by Brooke Van Sickle, Stone and Borup, as well as two Vander Weide aces to run away with the set, 25-10, and take a 2-0 lead into intermission. The Ducks hit .361 and Borup had five kills in the set. The Ducks scored four straight to take an 11-9 lead in the third, but the Rainbow Wahine responded with six out of seven to lead 15-12 at the media timeout. Oregon played back to within one, 22-21, but a kill and a block gave Hawai’i set-point, 24-21, before a Casey Castillo kill clinched the 25-22 win and forced a fourth game. Oregon used a 4-0 run in the fourth to take a 16-14 lead, but were unable gain separation from the Rainbow Wahine. Trailing 20-18, Hawai’i ripped off five in a row to move ahead, 23-20, before holding off a late UO rally to win, 25-23, and send the Ducks to a fifth set for the first time this season. Vander Weide took over early in the fifth set, putting down five kills to lead the Ducks to an 8-7 lead at the switch. Hawai’i moved ahead 10-9 before the Vander Weide’s sixth kill of the frame pulled the Ducks even, and a pair of UH attack errors followed to give UO a 12-10 lead. Two kills by Borup earned Oregon match-point, and the duo of Gill and Willow Johnsonrecorded the season-high 18th block of the night as the Ducks held off the Hawai’i comeback to close nonconference play on a high note. Who Stood Out: Raskie finished with an astounding stat line of 50 assists, 16 digs, seven kills (.385) and five blocks for her team-leading fourth double-double of the year, and Stone was also on triple-double watch with 11 kills, 10 blocks and eight digs. Vander Weide led Oregon with 14 kills while adding 12 digs and three aces, and Borup hit .385 with 11 kills and six blocks. Johnson had nine kills, six digs and five blocks, Gill hit .400 with seven kills and the freshmen duo of Brooke Nuneviller(16) and Camryn Tastad (12) combined for 28 digs. What it Means: The Ducks close an extremely tough nonconference schedule at 7-3 after picking up a pair of wins in a terrific volleyball atmosphere at the Stan Sheriff Center. Oregon faced four teams ranked in the top five through its first 10 matches, headlined by a win over then-No. 1 Minnesota at last weekend’s Big Ten/Pac-12 Challenge. The early-season experience playing against elite teams and in hostile environments should bode well for the Ducks as they prepare for a loaded 20-match Pac-12 schedule. Notable: Oregon’s previous season-high for blocks was 13 … Stone’s 10 blocks matched her career-high … Vander Weide recorded her third double-double of the year while Stone earned her first and second of her career … Raskie’s seven kills were a career-high and her 16 digs tied her career-best … Oregon held UH to .176 hitting and improved to 6-0 when holding its opponents under the .200 mark … Brooke Van Sicklehad an ace to improve her team-best total to 18 … The Ducks have now won three straight vs. the Rainbow Wahine, who lead the all-time series 7-4. Up Next: Oregon will host Oregon State next Thursday at 6 p.m. PT to begin Pac-12 play (Pac-12 Network). HONOLULU—The University of Hawai’i women’s volleyball team (4-5, 0-0 Big West) forced No. 12 Oregon to a fifth set, but came up short, 25-23, 25-20, 22-25, 23-25, 15-12. Hawai’i had three players finish with double-digit kills and five players recording 10 digs in the match. McKenna Granato had a match-high 16 kills while Norene Iosiaadded 13 kills and recorded her second career triple-double. Angel Gaskin tallied a UH-career high of 12 kills on Friday night at the Stan Sheriff Center. Granato racked up her fourth double-double of the season with 12 digs to go with her 16 kills. It was her seventh match with 10 kills. Iosia, UH’s setter/outside hitter had 13 kills with 20 assists and a career-high 16 digs. She arguably had the play of the night as she faked out the UO block as she approached for what looked like an attack off a dig, but proceeded to set up Granato on the outside to give UH set-point in the fourth set, 24-22. She also had a service ace and was in on four blocks for the ‘Bows. Gaskin came through with her biggest kill production of the season. The senior transfer from Maryland has started to get things going, recording double-digits in kills twice in the last three games. Faith Ma’afala posted her fourth double-double of the year with 34 assists and a career high 16 digs. Rika Okino, a defensive specialist, also recorded a career-high with 11 digs on the night. She also added three assists. Libero Tita Akiu tied her season-high with 26 digs. Akiu has posted double digits in digs in all nine matches this year. It marked her fourth 20 dig match this season. Natasha Burns tied her career-high with six blocks (two solo, four block assists). She pounded nine kills and also had a career-high six digs. On her fourth block of the night, Burns recorded her 100th career block a night after recording her 200th career kill with the ‘Bows. As a team, the Rainbow Wahine recorded 97 digs, the most since UH recorded 104 at UC Irvine on Oct. 31, 2014. It was also the first time UH had five players with over 10 digs since last year’s match against Illinois in the NCAA Tournament first round. The Ducks led throughout the early part of the first set, building as big as a four point lead at 16-12. Hawai’i however started showing signs of the never-say-die defense that they’re known for as they rallied to tie the set at 20-20. UH tied the score again at 21, 22, and 23 before UO scored the final two points to take Set 1 25-23. The second set was all Ducks. Oregon went on a 15-to-3 run to take a commanding 17-6 lead and never looked back. Hawai’i had no answers for the Duck attack as UO scored the last six-straight point en route to a 25-10 set win to take a 2-0 match lead. In the third set, both sides went on runs. First the Ducks had a 4-to-0 run to take an early 11-9 lead. But UH battled back to go on a 7-to-1 run to take a 16-12 lead. Hawai’i held the lead for the rest of the set, and won three of the last four points to capture Set 3, 25-22. Oregon jumped out to a quick 3-0 lead to start the fourth set, but UH came right back to tie things at 3-3. The two teams would tie the score five more times in the set. But it was Oregon who would take a little lead as UH fought to comeback. The Ducks led late at 20-18, but Hawai’i scored on a UO service error and a Burns kill to tie the score at 20-20. That was the start of a four-point service run by Ma’afala that gave UH a 24-21 lead. Burns later ended the set with a kill to knot the match score at 2-2 to force a fifth and deciding set. The fifth set was close early on. UH and UO tied each other eight times in the “race to 15.” UH took a 10-9 lead on back-to-back Granato kills, but after an Oregon timeout, scored three-straight points to retake the lead at 12-10. The two teams traded sideouts the rest of the way as Oregon hung on to win, 15-12. The Ducks were led by Lindsey Vander Weide who had 14 kills. Willow Johnson had a match-high 10 blocks, as Oregon out-blocked UH, 18.0-to-7.0. Hawai’i will now open their Big West Conference season on the road. The ‘Bows will take on UC Davis on Friday, Sept. 21 at 4:00 pm HT and then UC Irvine on Sunday, Sept. 23 at 12:00 p.m. HT. Prior to UH’s match against Oregon, Hawai’i hosted its annual Alumnae Game in which over 40 former Rainbow Wahine came out for the event.